Hurricane Earl - Atlantic Canada Threat - Ontario Storms Site! Hurricane Earl is currently located east of the Leeward Islands as a category one hurricane. Models are really starting to come into agreement with where Earl is going, and some models are hinting at a Nova Scotia landfall next weekend. Current NHC track takes Earl around the Delmarva Peninsula by Friday at 8am as a category three major hurricane. It could landfall anywhere from Long Island, NY to Cape Cod, MA then shoot northeast along the jet back into open waters, then landfall again around the Bay of Fundy area. If this were to occur, Earl would undergo considerable weakening as he would interact with land then emerge back over waters which would be very cold temperature wise. This could even lead to a subtropical storm or hurricane. Another scenario is that Earl could just skirt Cape Cod, MA then speed up northeast and slam into Nova Scotia, or just brush Nova Scotia while remaining over open waters the possibly affecting NFLD. The EURO for 24 hours now has been consistent with a Nova Scotia landfall around the Bay of Fundy area as a minimal hurricane, category one or two. The EURO also keeps Earl largely offshore New England, which would allow Earl to maintain hurricane strength. Below is a zoomed in graphic of the EURO long range forecast for Sat. Sept. 4.10 at 00z. Will be interesting to monitor the progress of Earl to see how Atlantic Canada may be impacted. 12z EURO run has changed Earl's track back to the west for 120 hours. EURO has also increased the pressure to 947mb, which means a more intense hurricane. 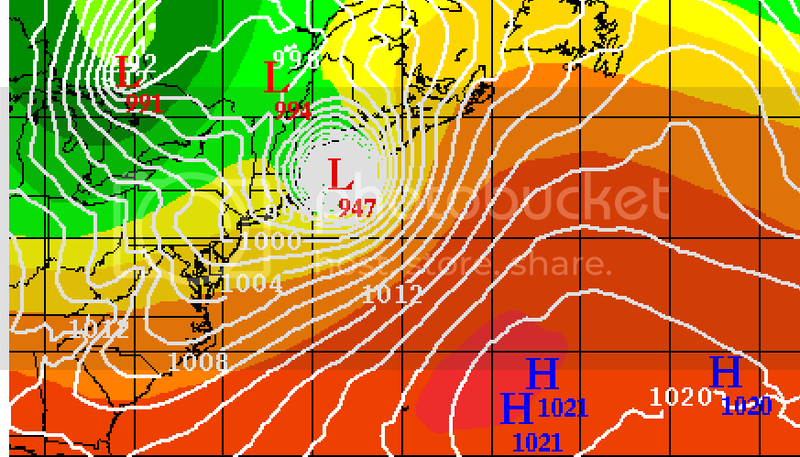 Looks like Earl just misses Cape Cod on this run then slams into Nova Scotia shortly after. The NHC has adjusted the track at 11am to include a possible direct landfall on Nova Scotia as at least a category two hurricane. MOVING NORTHWEST AT 12 KNOTS... 22 KM/H. THE NEWFOUNDLAND MARINE DISTRICT THIS COMING WEEKEND. AREA OF DRY AIR WHICH MAY INHIBIT FURTHER INTENSIFICATION. B. PROGNOSTIC FOLLOWING NHC ON BOTH TRACK AND INTENSITY. 30-40 PERCENT CHANCE OF A LANDFALLING HURRICANE IN NOVA SCOTIA. TO UNCERTAINTY IN THE CURRENT TRACK AND INTENSITY TREND. The CHC expects to issue further watches later today. AT 10:40 AM ADT THURSDAY 2 SEPTEMBER 2010. CANADIAN HURRICANE CENTRE HAS POSTED A TROPICAL STORM WATCH. THE SPECIFIED AREAS LISTED ABOVE. 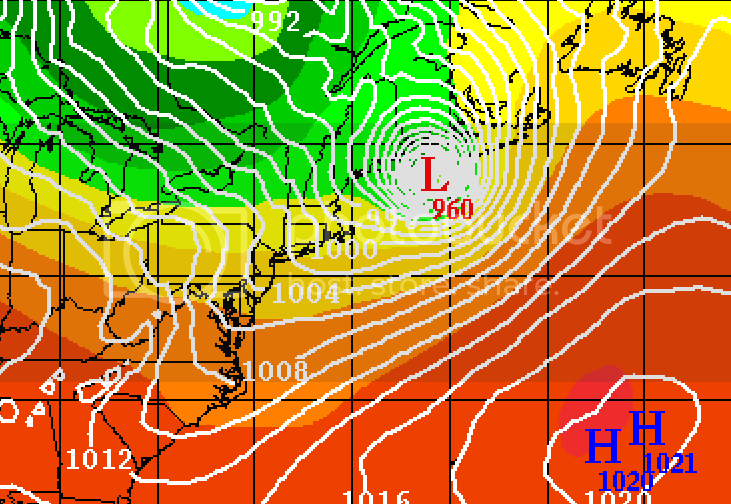 COULD REACH EXTREME SOUTHWESTERN NOVA SCOTIA LATE FRIDAY EVENING. WILL COVER THE FRIDAY NIGHT FORECAST PERIOD IN GREATER DETAIL. AT 938 MB. EARL IS MOVING NORTH NORTHWEST AT 16 KNOTS... 30 KM/H. SCOTIA..NEW BRUNSWICK.. AND PRINCE EDWARD ISLAND LATER TODAY. INFORMATION WILL APPEAR IN OUR NEXT BULLETIN AT 3.00 PM. PLANS THAT MAY BE SENSITIVE TO HIGH WIND AND HEAVY RAIN CONDITIONS. BE REQUIRED FOR PORTIONS OF THE ATLANTIC CANADIAN MARINE DISTRICT. WILL BE ASSESSED FURTHER AS WE GET CLOSER TO EARL'S ARRIVAL. OUR FORECAST OF INTENSITY AS THE STORM MOVES OVER THOSE WATERS. EARL TO RETAIN MORE TROPICAL CHARACTERISTICS AS IT ENTERS OUR REGION. ANOTHER FACTOR WHICH WILL WEAKEN EARL. REPRESENTS THE AVERAGE OF MANY FACTORS. SATURDAY MORNING..TO SOMETIME SATURDAY AFTERNOON. WHEN CONSIDERING THE TRACK FORECAST RELATIVE TO YOUR LOCATION. Last edited by Derecho; 09-02-2010 at 12:30 PM. AT 2:11 PM ADT THURSDAY 2 SEPTEMBER 2010. AREAS WITHIN 36 TO 48 HOURS. NEW BRUNSWICK EARLY SATURDAY MORNING. SOUTHWESTERN COUNTIES OF NOVA SCOTIA EARLY SATURDAY MORNING. THE MARITIMES ON SATURDAY AS EARL TRACKS ACROSS THE REGION. 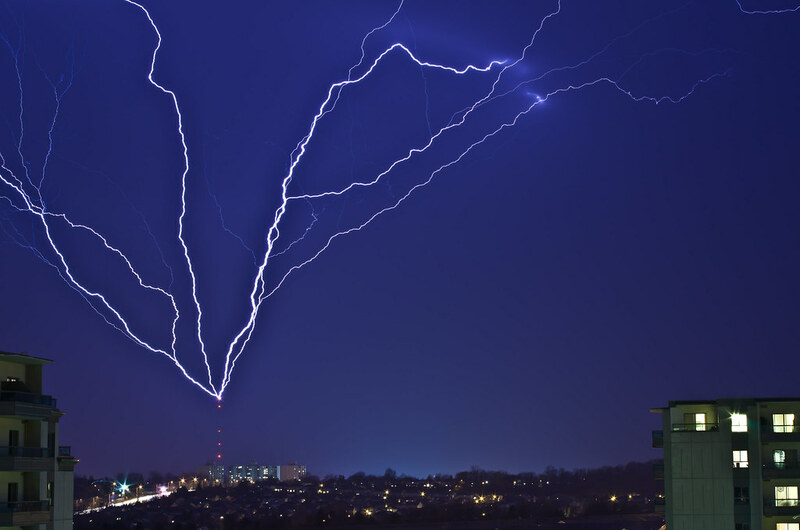 Canada at 4:46 AM ADT Sunday 5 September 2010.
with an intensity of 65 knots / 119 km/h. night as it moved out of the Gulf of St Lawrence. New Brunswick and Prince Edward Island.